In the three major Indian Armed Forces, the Indian Air Force is the most considerable thing which was actually incorporated on October 8 of the year 1932. The chief task of this IAF (Indian Air Force) is to protect the Indian airspace. The officers working in the IAF have been getting a wonderful pay scale with the proper recognition of their work and efforts. When it comes to the flying officers working in the Indian Air Force, they will get pay scale about Rs. 15, 600 to 39, 100 according to the pay scale band PB-III. The grade pay of the IAF flying officer will be 5400 whereas the median scale is 6000 for all flying officers. 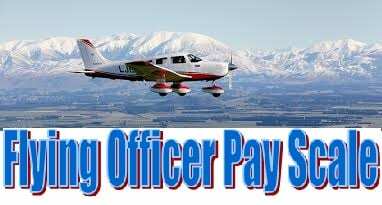 If the flying officers are working in the ground duty branch, they will get average salary of Rs. 54, 860 in lakhs per year. For the technical branch flying officers, the total annual salary will be Rs. 57, 360 in lakhs. If the flying officers are working in the flying branch, they will get Rs. 66, 110 in lakhs per year. Indian Air Force (IAF) is definitely a very good field to earn highest amount of salary throughout one’s career along with the several allowances and perks. DA (Dearness Allowance) – Rs. 30, 5100 / month at the rate of the 113 % of the basic salary. Kit maintenance allowance – Rs. 600 / month. Flying allowance – Rs. 13, 500 / month. Transport allowance – Rs. 32, 00 along with the DA in the major cities and Rs. 1600 along with the DA in other cities. The flying allowance of the flying officers in IAF will be Rs. 11,250 / month when they are working in the flying branch. And for officers in technical branches they would receive Rs. 2500 / month as technical allowances. There are so may perks available for the flying officers. Those facilities include housing facilities, lifelong pensions, free education to the children, free medical facilities and more. Moreover, as ranks of IAF officers increases his responsibilities and entitlements too gets increased along with his income and allowances rate. The salary structure of the Indian Air Force flying officers is here in terms of their experience. Under the 7th pay commission, the retirement benefit of the IAF flying officers gets increased. The basic pay and grade pay of the officers too increased. The travel allowance facilities to the flying officers have as well as been increased. There are also several modifications made for the night duty and overtime allowances for all the flying officers. Allowances given to the education of the IAF officers have also been increased under this commission.